Ithaca, NY — GrammaTech, a leading provider of software assurance tools and cyber-security solutions, today announced that CodeSonar, the company's flagship static analysis software, has again been certified for use in the development of safety-critical software. SGS TÜV Saar GmbH deemed CodeSonar 4.1 certifiable according to the ISO 26262, IEC 61508, AND EN 50128 international standards, which define the functional safety of electronics within industrial applications, automotive systems, medical devices, and railway applications. Functional safety standards are becoming more prevalent in international markets, as the use of software in mission-critical and safety-critical applications continues to grow and the need for better safety and security continues to be a pressing issue. Static analysis simplifies the enforcement of coding standards across development teams, improving the overall compliance for a required certification standard while also improving the quality of the code. CodeSonar in particular provides key features and integrations to encourage efficiency among teams. "The automation and thoroughness that static analysis provides is crucial for supporting safety-critical software development and for ensuring adherence to safety standards," explained Paul Anderson, VP of Engineering and GrammaTech. "As functional safety standards have become more prominent, we have continued to add new static checks and additional features into CodeSonar so it can support our customer's compliance with these standards." CodeSonar currently supports compliance with MISRA C: 2004 and 2012, ISO 26262, DO 178B, DISA STIG, FDA, MITRE's CWE, NASA'S JPL rules, and U.S. CERT's Build Security In (BSI). 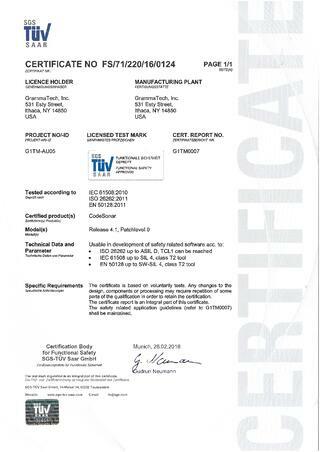 The certification given by SGS TÜV is shown below. GrammaTech tools are used by software developers worldwide, spanning a myriad of industries including avionics, automotive, government, medical, and other applications where reliability, safety, and security are paramount. Born from research carried out at Cornell University, GrammaTech continues to advance the science of software assurance, software hardening, and autonomic computing, providing techniques and technology for software teams to produce safer and more resilient software. More information about GrammaTech can be found here.